When I go to 5:45 classes at Fusion, I treat myself to a latté from what I dare say is the best coffee shop in the KC Metro. 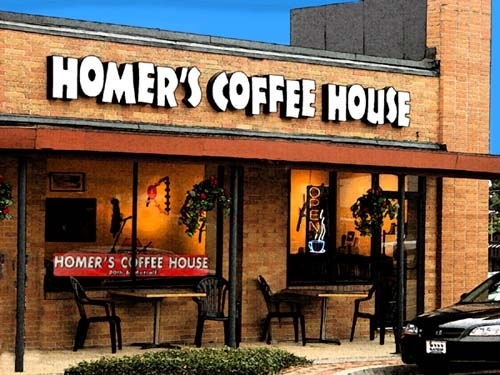 I know that's an extremely bold statement, but now if I'm having an especially rough morning, I take a different route to work so I can stop at Homer's for a delicious cup of the best coffee I've ever had. I'm no coffee aficionado, whatsoever. I can't tell you if it's bolder, nuttier, sweeter, blah blah blah. All I can tell you is that I can't stomach the thought of drinking Starbucks coffee now. I've tried to return to the BUX a few times, but I wind up with disappointment immediately following that first sip. Also, I don't know if it's possible to build up a resistance to the caffeine of certain coffee blends, but I get a more significant jumpstart from Homer's coffee. I have no idea how she does it. It's one thing to recognize someone. It's a whole other thing to recognize them and remember their story. Without knowing their name. I wonder if she has some sort of quirky pneumonic for me. Girl with crazy curly hair = June destination wedding. Last time I was in we exchanged blog URLs. I would share hers here, but I'm not sure how personal she wants it to be. 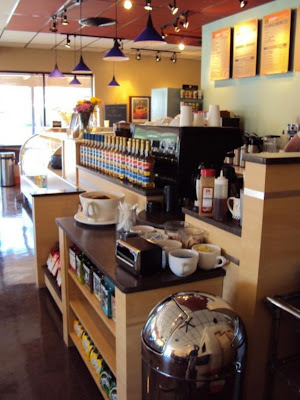 Homer's is in downtown Overland Park, and it would be a great Saturday morning spot to grab a great cup of coffee, and then head over to the OP Farmer's Market - one of the top 3 in the city. If you go, let me know what you think! I've added this to my KC area list of places to go. Love a great coffee shop! Ha! Hilarious that you two found each other in the inter webs! Allison, I worked with Carly in KC. Carly, I went to KU with Allison! Too funny. Let me know what you think, Allison! Corrina, I knew about this rando connection thanks to facebook - I actually met Allison via Molly who I used to work with. You are so sweet! Thanks for the Homer's praise--I'm so glad you enjoy it. As for how I remember you--for one, I'm great with faces and names. And two, you do look like Ashley Judd. See you soon! This coffee shop i personally liked. If anyone want to drink fresh coffee then need to go Oceana Coffee Shop. This is a best coffee shop. Various type of coffee is available here.